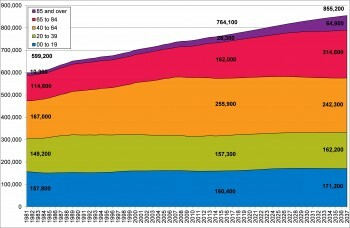 Figure 3.6 shows the actual and projected change in the number of people in Devon from 1981 to 2037. While there is relatively gradual change in the under-40 age groups, the major change occurs in the population over 60 years, both in numbers and as a proportion of the whole. 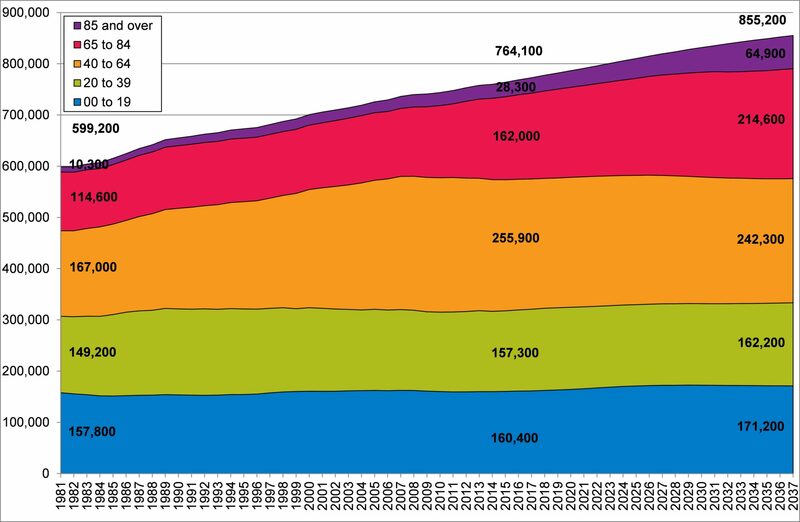 The increase in the 85 and over population is particularly striking, increasing from 10,300 in 1981 to 28,300 in 2015, and projected to reach 64,900 by 2037. The dependency ratio is a measure showing the number of people aged 0 to 14 or 65 and over, per hundred people aged 15 to 64. This means the higher the ratio is, the higher the proportion of people in these younger and older age groups. This is a measure used for international comparison and it should be noted these so called ‘dependent’ age groups do not necessarily reflect wider economic changes, which means people over the age of 65 are increasing likely to be economically active (rising from 10% in 2001 to 12% in 2011). However, it does give a useful indication of the impact of changing population structures, which in turn can have an impact on demands for health and care services and the workforce required to support these demands. Figure 3.7 reveals the dependency ratio dropped between 1981 and 2007, largely as a result of the ‘baby boom’ generation born in the 1960s (when birth rates were higher than the 1950s and 1970s) entering the 15 to 64 age group, with the dependency ratio going down to 59 in Devon in 2007. However, persistent increases in the dependency ratio have been seen over recent years as a result of lower birth rates in the 1980s and 1990s (meaning fewer people joining the 15 to 64 age group), and the ‘baby boom’ generation of the late 1940s reaching the age of 65. 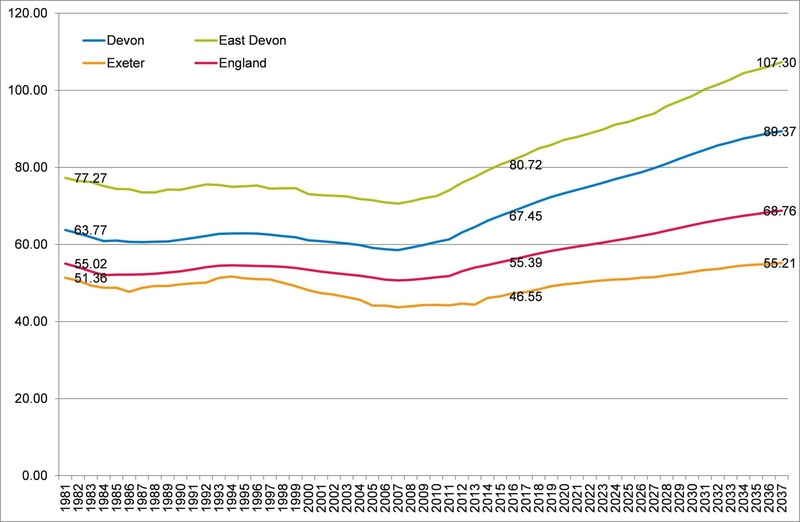 Over the next 20 years the dependency ratio is set to continue to increase, and by 2037 is predicted to reach 89 in Devon, 69 in England, 107 in East Devon (the district with the highest ratio) and 55 in Exeter (the district with the lowest ratio). 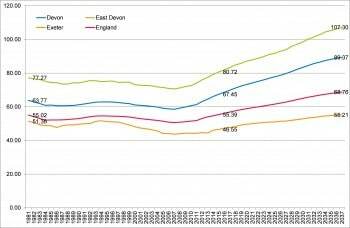 The current dependency ratio in Devon (67) is only marginally below the predicted England ratio for 2037 (69).